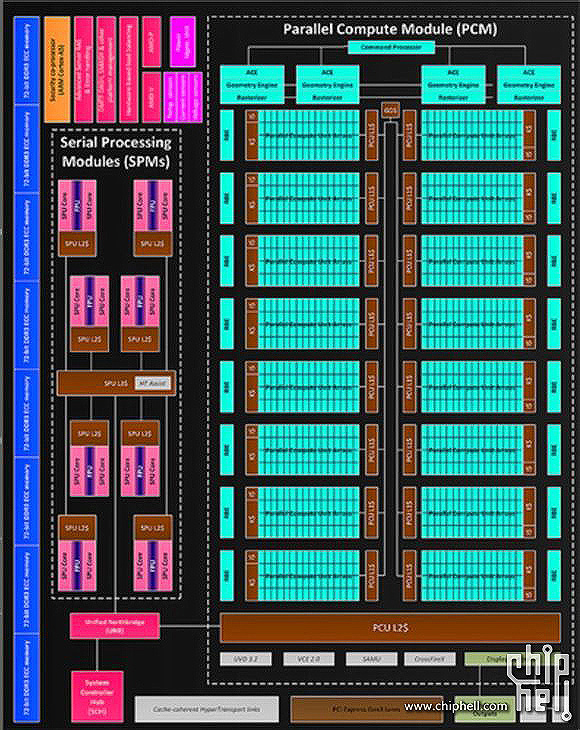 Our colleagues at XbitLabs did a pretty good job at enhancing the fuzzy image that has been circulating the web of the mysterious block diagram thought to be a future generation of AMD GPU. In the now sharpened picture, we can see even more clearly the speculated Steamroller cores, 16 of them with a shared FPU unit for each pair, but also – and most importantly – a northbridge, PCI-E 3.0 lanes and the eight memory controllers that are 72-bit wide, providing support for ECC. With this new information in hand, it becomes obvious that we are looking at a full-blown, high-performance system-on-chip (SoC) and not a GPU. The part appears to feature 16 SMUs, as stated earlier, and if those were based on AMD’s current Graphics Core Next architecture we would be looking at 1024 shaders, making this SoC similar to the one AMD is building for the new Playstation 4, except with much more serial computing power. The PS4 chip will have a little more GPU power with 1152 shaders but fewer serial processors, with only 8 low-power Jaguar cores. While we’re speculating, let’s also say that it could very well be a very-high performance APU for desktop computers. It is also hard to ignore the distinct possibility of a server part as it would boast some serious computing power, support for ECC memory and 16 Steamroller-class CPU cores that will have to be clocked pretty low to keep the total TDP reasonable. No matter where AMD is going with this design, it displays innovation and promises impressive power. This would be excellent news - I have to imagine some improvements in the power and heat areas if this thing actually has 16 freaking cores in it. Especially if this is roughly what will be used in the consoles that are coming out (I really don't think microsoft wants any more heat issues).